We spent the entire day processing a couple of boat loads of Hood Canal spot prawns. Now we're totally exhausted, but excited about the super tasty shrimp. If you want to experience the thrill of fresh shrimp (and that sounds sarcastic, but you'll understand once you try them), you can buy them either cooked or raw in our retail store. If you're nowhere near Lilliwaup, you can have raw shrimp shipped to you on Monday, May 4th. If we have any shrimp left after Monday we're going to freeze them. 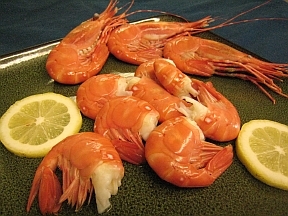 Order shrimp online at www.hamahamastore.com, or by calling 888-877-5844. Available for a very, very limited time. Hood Canal Shrimp!!! What a happening. My 2 brother in law’s and I got our limit and we were cleaning them by 11:30 am. We dropped our pots about 1/2 mile south of Hood Point. Home made shrimp traps to boot! We skewered a bunch and grilled them supper. Sweet and briney….unlike any other shrimp I have had. Hope you sell a bunch! Do you have a good Hama Hama Shrimp recipe I should make for Sue’s dinner tonight? I was thinking a stir fry but any suggestions welcome. BTW, we could tell that there seems to be a lot more traffic on 101 with the bridge closed. Batten down the hatches; looks like some wind coming to Hood Canal tonight. We had these shrimp for dinner tonight (as well as some of your crab) and they were AMAZING! We just did a simple, spiced boil and dipped them in garlic butter. The best shrimp I have ever had. We tried to experiment with various shrimp recipes on Saturday… we made some delicious shrimp pasta (with linguine, tomatoes, basil, garlic, onion etc., and Parmesan), coconut shrimp (not a huge fan), and garlic shrimp (scrumptious)… but really I think the best way to eat fresh-caught shrimp is just lightly cooked, either steamed, boiled, or sauteed, with either a lemony mayonnaise or garlic butter to dip them in. That way you get the full shrimp experience. Heavy sauces and seasoning are for frozen shrimp, right? And yes, the road is noticeably busier. But it’s not too busy, although the semis using the highway at night are pretty noisy. Thanks Adelaide! We think so too. Ed, our shrimper, did a fantastic job getting the shrimp up to the store immediately after he caught them, when they were all still alive, so we were able to get them processed and on ice right away. Glad you liked them!